I was the victim of a hit-and-run accident. A motorcycle crashed into me as I was walking on the sidewalk causing my left leg and ankle to break. Although that was almost 30 years ago, the older I get, the more frequently I get reminded of my injuries through pain in my ankle and knee. I ran 5K races since I was 12 years old but gave them up in 2012 due to the pain and stiffness in my ankle from my injuries. I saw various doctors and physical therapists in recent years, but none really had a long-term solution for my pain that didn’t involve medication or surgery. Since 2012, I gradually reduced my physical activity and my leg pain continued to be a problem. Any time I knew I had to walk long distances (like taking the kids to Disneyland), I would carry a backpack full of different types of shoes, socks, and pain-relieving creams in the hopes that I could make it through the day without impacting our family fun. A few years ago, my husband started coming to Zen Rock and training with Nova. I was skeptical of using a personal trainer. I belonged to the Pro Club for years and never used one. But like him, I was putting on weight and after a few months, he convinced me to come along. It was shocking all the things I couldn’t do, all the movements I couldn’t make. I started joining him twice a week for hour-long sessions, with one of those sessions being yoga. I started getting stronger and more flexible, but I still had my leg pain. The limited movement in my ankle made some yoga movements difficult, made it hard to keep a good form for squats, and made any higher impact exercises like jumping rope nearly impossible. Even grapevines down the hallway were done slowly and deliberately so as to avoid tweaking my knee and causing pain. At the start of every training session, Nova asks me how I’m doing. Granted she knows the answer is usually that my ankle or my knee hurts. The great thing is she was able to change my routine to accommodate for the pain and still make me stronger. Eventually, I realized I needed more exercise outside of the strength training and yoga, but what could I do? I decided I needed to start swimming and joined the Pro Club once again. This is where things get interesting. The swimming in combination with the strength training was helping to strengthen my core. But then Nova did something I wouldn’t have expected from a personal trainer and suggested I do a triathlon with her and Petra. I could do the swimming part. Little did she understand how slow and out-of-shape I was in the pool. But it was the thought that maybe I could do one leg of a triathlon that really inspired me. I started swimming more laps and more often. I took a triathlon swimming lesson and bought a wetsuit so I could practice swimming in open water. Nova even took her paddleboard out on a cloudy, somewhat windy day in the Spring while I tried to swim in Lake Sammamish. All this activity made my core so much stronger and my strength training sessions changed to focus on core strength and upper-body strength. And I had to add in more yoga because my muscles were sore and tight. But the interesting side affect was that my knee and ankle didn’t hurt as much, and for many weeks, they didn’t hurt at all. When I say that your core is core, I truly see the results of this. Whenever I have some leg pain, I’ll engage my core while I’m walking or standing, and the pain goes away. By focusing on walking using my core instead of walking using my calves, I’ve reduced my leg pain significantly. I swim 2-3 times a week, and workout at ZenRock twice a week. Over the summer, I got a paddleboard and never fell in the water because I could balance well due to my strong core. 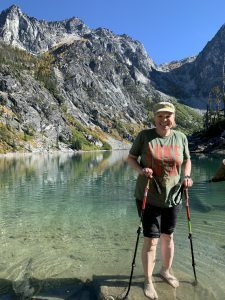 In September, I hiked a 9-mile hike to Colchuck Lake (the entrance to the Enchantments) without any knee or ankle pain. During a recent yoga session, I was finally able to do Crow without immediately falling over (I finally have upper body strength!). And during my family’s recent Halloween trip to Disneyland, I walked 12 miles for 3 days in a row with no ankle or knee pain. Granted, I still carried my backpack of shoes with me, but old habits die hard. What does the future hold? It’s hard to say if I may be more comfortable in open water this next year and if my endurance has increased. So maybe there is a team triathlon in my future. Or maybe I’ll try to do some running again. I definitely will be out on my paddleboard on the lakes in the area. Maybe I’ll see you there!